Legs eleven - tights in the summer. Vanity. Legs unless long, slim and brown look a bit rubbish. And toes are ugly. Pasty legs and knees and toes sticking out from shorts and cotton skirts are not my cup of tea. In fact I don’t think even beautiful bare legs ever look as good as they would in seams, just don’t like them. It’s a taste thing. Comfort. I find my feet blister easily in sandals and shoes in the heat if I do not wear socks or tights. Hygiene. Without socks or tights you sweat directly into your sandals and shoes. I feel drier and less damp in opaques. I hate sticky skin and I don’t want London dirt over my feet. I found in Asia that like the locals being covered up was sometimes more effective than light clothing in keeping cool. Health. Tights and socks keep the sun off and mosquitoes away. Also if I am doing anything active I want to be able to move around and I find sandals impractical, apart from the blisters they feel flimsy. And men do have a habit of standing on one’s feet in tube trains. Aesthetics. The sun n’ surf, wear a kaftan, look like a festival goer or a sweet forties land girl in a field look is never, as anyone who knows me will testify, the way I am going to choose to look. I like hard edges, good heels and dark colours. 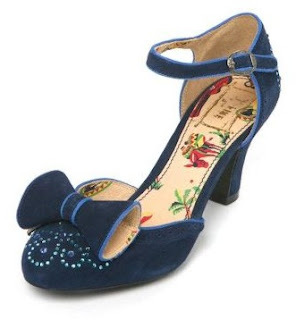 These don't work with bare legs and painted toesies. Before I start let me warn the reader, I am an Olympic cynic and whilst I am happy other people are having fun and feeling proud, I’m not an Olympic bunter myself. I thought the views of a dyed in the wool born and bred Londoner on how the place feels might be interesting. It is just an opinion, if I wrote about the Olympics per se it would turn into a long rant! The ugliest logo in Olympic history? What is it like to be in an Olympic City? Well quite peculiar, it is as if a large alien parasite has suddenly landed, crablike on the city and taken it over. Or maybe it is more an like Invasion of the Body Snatchers. We knew stuff was being built in a bit of London most of us never go near at great expense but suddenly, with fireworks and a lot of entertaining Danny Boyle directed guff it was upon us. 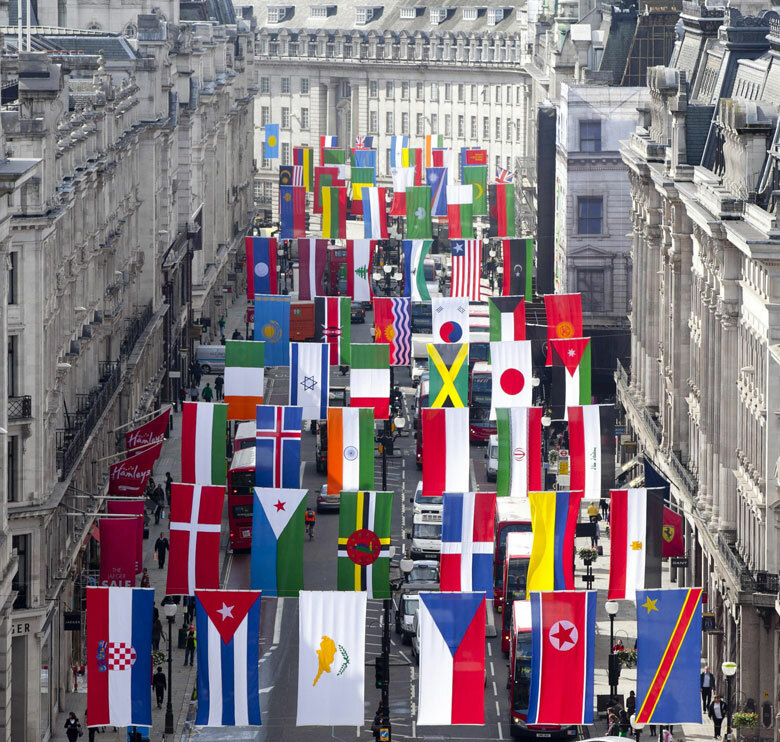 London is again festooned with flags, a riot of international colour this time rather than the red, white and blue of the Union Flag. 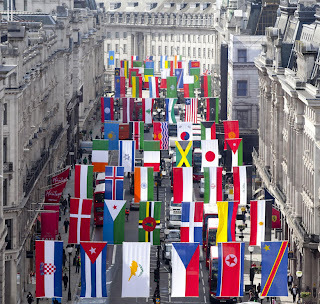 This flag business is a good thing and is very attractive, we should have more flags every summer; I’d like to see a load of Jolly Rogers on Regent’s Street! 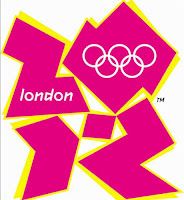 Unfortunately the official designs for the Olympics are uniformly ugly. 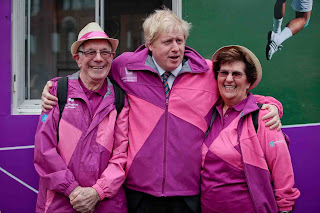 London is enveloped in purple with a cerise accent (it is like someone chewed a wine gum and spat it out over the city), an ugly font and an inelegant symbol outdone in ugliness only by the grotesque mascot who bears the kind of name you expect a Dickensian murderer to have. 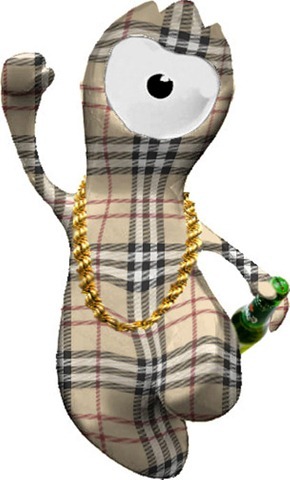 Not that that is a problem, I like the name ‘Wenlock’. I think the swimming pool should have been called the ‘sink’ and the main stadium the ‘bear pit’ for true London authenticity. London has also been invaded by an army of happy volunteers wearing shell suitey type things in the aforementioned nasty colour scheme, the whole place is awash with garish nylon. The city is also full of people often proudly occasionally smugly wearing big plastic squares with the word ‘OCOG’ emblazoned on them. Those that are not Olympic storm troopers are similarly generally wrapped in sportswear. Everywhere you look people are got up like seven year olds in crackly brightly coloured clothes. The static generated must be fantastic. When you are not party to the sea of Olympic spectators it is an odd feeling, curiously Kafkaesque, of suddenly being a stranger in your own home. Like coming home from holiday to find someone has moved into your flat, but in a friendly way. 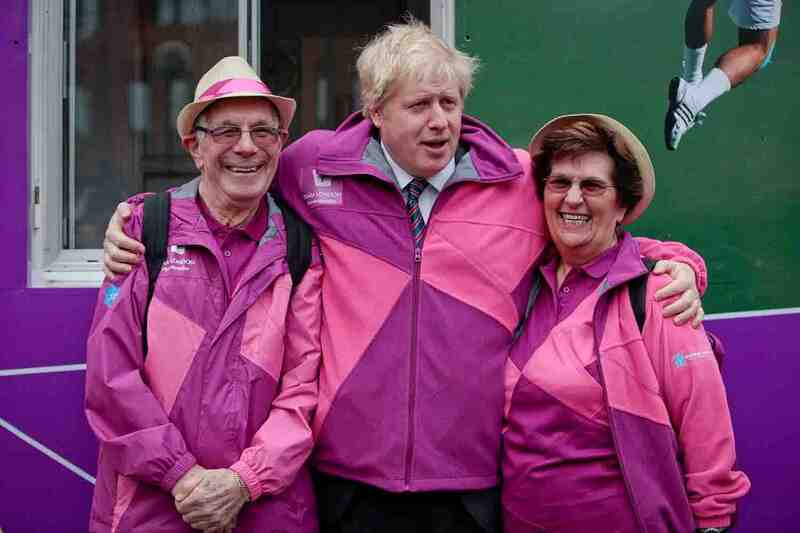 Terrible uniforms invade London Streets...but I like the grins. There are only two ways to approach the thing really; one is to wholeheartedly throw yourself into it and indulge in Olympic Spirit until the British position in the medal league becomes your sole overriding obsession. The bread and circuses approach is not to be dismissed, the money has gone, it will be gone when this is over so some might as well have a bit of fun and entertainment while it is here. The other approach is to quietly let it be, avoid the areas where it is happening or leave the country. There is no real escape however short of moving to a cave and if you are not a sports fan you just have to quietly grit your teeth and get on with it, it is only a couple of weeks after all. Pretty flags, we've got them now, can we put them out every summer? There was a lot of scare mongering before the whole thing kicked off. Yes London Bridge station was doing a good impression of a scene from Bosch when I visited it, the rudeness of some of the visitors was startling (so much for Olympic Spirit) but the volunteers were doing a good job. It takes a certain amount of verve and fortitude to answer the same daft question forty times in a day. But they have seemed to be unremittingly cheerful and good natured which should give visitors a totally unjustified impression of Londoners as a jolly welcoming lot, like Italians but without the sunshine. Mind you the system of 'penning' travellers in was worrying, especially as the queues for particular platforms suddenly switched, a bit like the railway version of Hogwart's corridors. 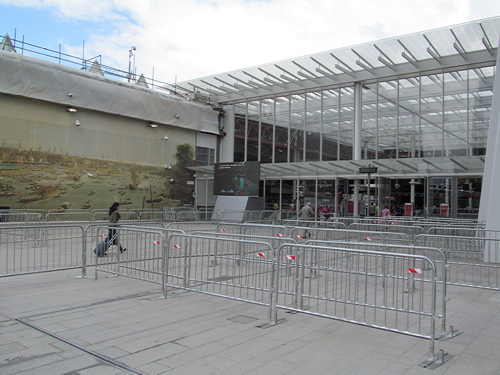 The 'pens' for commuters at London Bridge. Lots of people have heeded these doom laden warnings and taken the avoidance approach. I have never seen central London quieter; there were more people around after the bombings. Seats can be obtained on tubes and trains, theatres, pubs and clubs are quiet and last Saturday I could see broad expanses of pavement on Oxford Street. This was very pleasant for me but not so good for traders and businesses. This was even the case during the hugely popular torch relay; people didn’t really buy much from local bars or cafes who were advised by local councillors to get extra staff in. But as a relative of mine said regarding the popularity of the torch relay ‘Londoner’s will go and watch the opening of a curtain if it is free’ and restaurants and pubs aren’t. 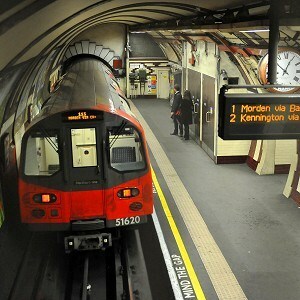 Nothern line was still running at 1.00 am, why only during the Olympics? I haven’t watched much of it but ultimately it hasn’t had much negative impact on me or much impact at all really. I may get cross when the next big sweep of nurse sackings takes place especially as some of those dancing nurses are likely to get the chop. 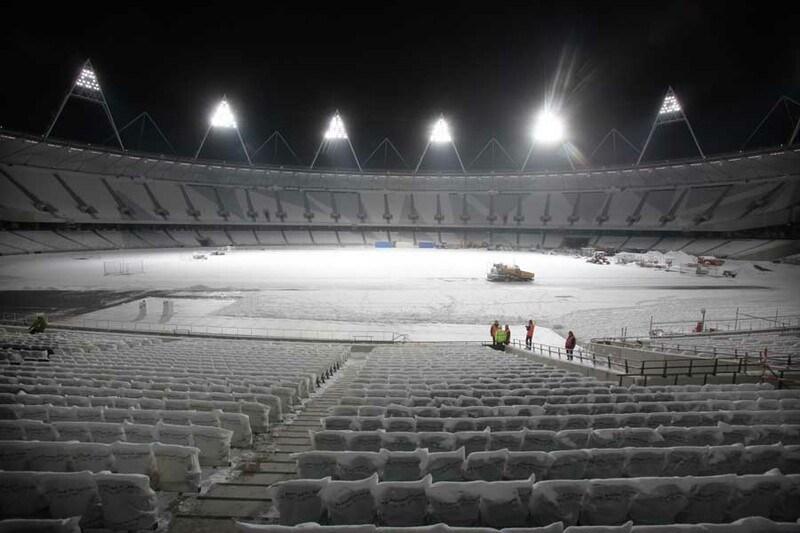 But for now I can at least, if nothing else, appreciate the surreal quality of Olympic London. There is however one aspect of it that I am complete impressed by: the underground trains running later, significantly later on Fridays and Saturdays. 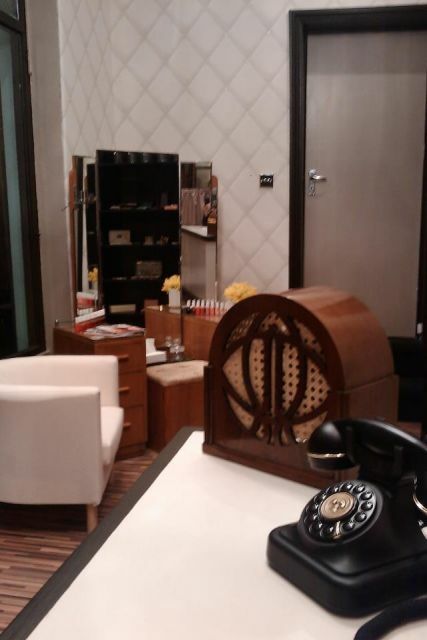 For a single London lady about town it makes a big difference. Why not have the late Friday and Saturdays all year? Any future mayoral candidate who pushes this will get my vote. I also realised on Saturday that my Chinese dress was in the Olympic pink and purple (don’t ask), is the body snatching Olympic crab parasite subconsciously taking me over too? But what will our government do with the used and finished article? I considered the other day who my vintage ‘dream team’ might be? If the vagaries of time and motion could be overcome, bank accounts were full of shekels and I could beam myself around London Star Trek style? First of all the basics, eyebrow shaping, facialistic fiddling, eyelash lashing the clipping of nails and the waxing of, well whatever needs to be waxed. For this I would find myself in Anerley Hill in the elegant surroundings of La Belle Jolie, listening to Ella Fitzgerald whilst talons are painted jungle red by the charming Renee. Basic canvas prepared and polished I would need to consider my hair. Should I want a perm with a vintage set I might jump on a mystery train to deepest darkest Walthamstow to see Claire who knows her way around a set of perming rods. I’d get a mug of tea and a complimentary cute dog. If I wanted to then trip off and buy the perfect little thirties day dress in mint condition I might board a steampunk airship to the Vintage Emporium off Brick Lane, which also sometime provides good dog stroking opportunities. 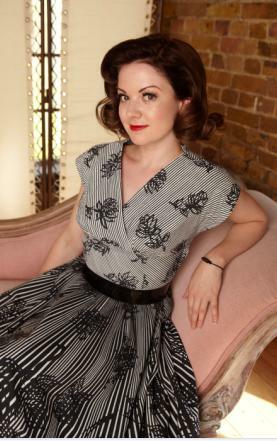 If in need of vintage shopping advice I might turn to the lovely Naomi Thompson to come and help me out. My underpinnings would be provided by What Katie Did as second hand undies are not my thing and WKD’s mesh seams are amongst the toughest most glamorous hosiery items there are. If I want to set my look off with a nice brooch I would then find myself at the little retro fair at Norwood Feast with friendly sellers, funky music, cheap prices and that relaxed Sarf London vibe. 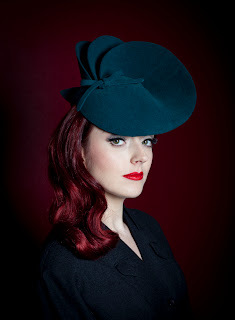 I would top it off with a bespoke hat from Kezia Argue, Atelier Millinery or Pip Hackett. Shoe wise the Miss L Fire website would magically transform into a physical shop with handsome boys in tops and tails offering a range of colourful shoes for my perusal. Finally I would trot into a ChapOlympiad, drenched in sunshine with a Fortnum and Mason’s hamper on one arm and a moustachioed gent with a twinkle in his eye on the other. Well that is my London Dream Team, what’s yours?